When one of Clover’s missions reveals that West’s life is in danger, the Donovans are shattered. To change West’s fate, they’ll have to take on the mysterious Company. But as its secrets are revealed, they realize that the Company’s rule may not be as benevolent as it seems. In saving her brother, Clover will face a more powerful force than she ever imagined? and will team up with a band of fellow misfits and outsiders to incite a revolution that will change their destinies forever. The Bad Times start when an virus of unprecedented strength ravages the planet. First comes the fever, then the sores, and just days after infection, there is death. No cure is in sight, and the world’s population quickly succumbs to this devastating virus – the United States is hit particularly hard. But one day, hope is reborn. A desperate scientist, Ned Waverly, discovers a portal in the murky waters of Lake Tahoe – one that allows him to travel exactly two years into the future. Through this portal, Waverly finds that a serum has been developed by himself and his partner, chemist Jonathon Stead, and in a desperate bid to save lives Waverly takes a sample of his own drug back to his original timeline two years in the past. While not a cure, the suppressant is a game-changer that ensures the survival of the human population – as long as it is injected on a daily basis, the suppressant is able to counteract the effects of the deadly virus. With the discovery of the serum, society slowly begins to rebuild. Cities are walled off, and the company that manufactures the Waverly-Stead suppressant (known simply as The Company) naturally assumes complete control of the new thrust of civilization. This is the world that siblings sixteen-year-old Clover and seventeen-year-old West inherit. After their mother dies of the virus, their father slowly unravels, eventually abandoning his children for his work as a Company executioner. West has been in charge of Clover ever since, avoiding any future prospects to make sure that he is there to provide for his younger sister – anything to keep her out of Foster City, which could be especially hard on his autistic younger sister. When Clover finally comes of age to finish primary school and tests to get into the prestigious Academy, she passes with flying colors and is invited to join the full-time university for a chance to train for a high-skills future with the Company. Unfortunately, Clover’s bright future is cut short when she goes for her entrance interview at the school and the Headmaster realizes that Clover is autistic. Instead of accepting her into the program, he sends her off on a new career track: Clover is to become a messenger, on the path to becoming a Time Mariner. That is, she gets to travel through the portal into the future, bring back key information, and help the Company keep law and order. Clover and her brother are stunned but pleased with the good news – that is, until Clover receives a message from the future that things aren’t what they seem, and that her brother is accused of a crime he would never commit. As Clover and her brother discover the truth behind the Company, the serum, and their future, their lives will never be the same. Together, with the help of their new friends, Clover and West will start a revolution. PHEW. Let me preface the review part of this review by saying, that was one LONG synopsis to write – and I draw attention to this because there is a LOT going on in this book. Not only is it a future post-apocalyptic dystopian novel following a devastating plague, but it’s a post-apocalyptic dystopian novel with time travel. Not just any time travel, but a sub-aqueous portal that travels only precisely two years into the future. Needless to say, there is a lot going on in Shaunta Grimes’ debut novel… and yet for all of the disparate pieces and even allowing for some of the more tough-to-swallow parts of the story, Viral Nation somehow inexplicably manages to pull it all off. Beyond Clover, the other character that truly stands out is her brother, West. The relationship between the siblings is refreshingly healthy and one of love and respect – importantly, no one treats Clover like she’s a fragile doll and there isn’t any insipid “I must protect you from the WORLD!” mentality going on, even with Clover’s love interest. West is smart and responsible, but he also lets Clover do her thing, even if he doesn’t like it. I respect that. 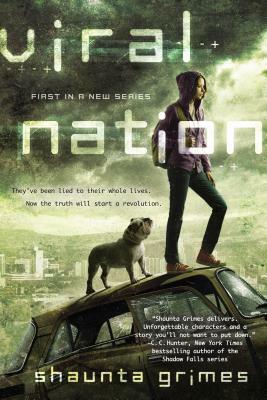 From a worldbuilding point of view, Viral Nation takes a classic dystopian setup and adds a few key twist. The inclusion of very specific time travel initially threw me, but Grimes more or less manages to pull it off. We don’t know too much about this mysterious two-year portal although by book’s end there’s a shocking revelation about the nature of the portal and who can travel through it (a bit tough to swallow, but ok, I’ll buy it for now). There are a lot of questions posed in this book that I’m willing (and I’m betting other readers will be willing) to let slide for now because it’s a setup book – but answers better be coming in the second novel in the series. The nature of time travel in this book, because of the two year window, is actually fascinating. The core axiom here is that by learning about the future, things inevitably change by the very nature of having that knowledge. That is to say, the future timelines that Clover visits on her messenger runs will never come to be – the entire impetus for the book is when Clover visits the future and receives a flyer that says her brother will kill someone, and that knowledge is meant to be taken back to the past so that West can be executed before the act transpires. Clover and West change that future, which rocks the entire justice system out of balance. This is a premise rife with paradoxes and potential loopholes, and while Grimes doesn’t really examine these in depth, I like the underlying logic that the future is a fluid and changing thing. We’ll see if the series manages to continue with this premise without letting the story get away from it. I’ll certainly be back for book 2. Viral Nation manages to take a familiar setup and imbue new life into the run-of-the-mill dystopian by virtue of its unique and memorable heroine, and its unexpected science fiction twist. Recommended, especially for the fan who is looking for something beyond the usual YA romantic dystopian hegemony.